As part of each release, the ONAP community also defines blueprints for key use cases, which the user community expects to pursue immediately. Testing these blueprints with a variety of open source and commercial network elements during the development process provides the ONAP platform developers with real-time feedback on in-progress code, and ensures a trusted framework that can be rapidly adopted by other users of the final release. The latest ONAP Release, Casablanca, introduces two new Blueprints: 5G, and CCVPN. 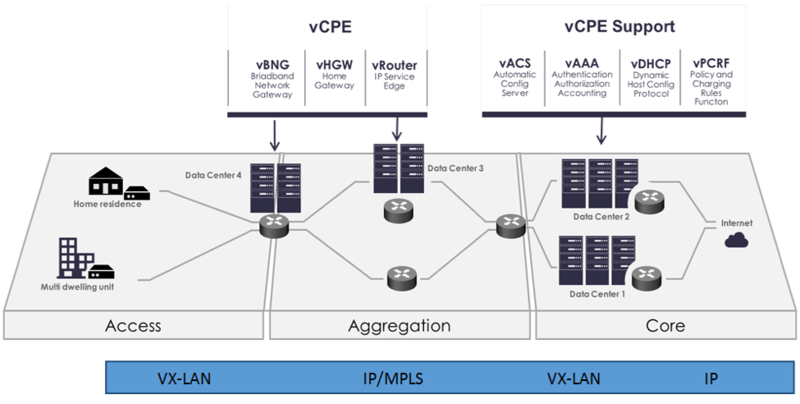 Prior blueprints include VoLTE, and vCPE. Each new release tests additional functionality or new blueprints. Scroll down to see them all. The 5G blueprint is a multi-release effort, with Casablanca introducing first set of capabilities around PNF integration, edge automation, real-time analytics, network slicing, data modeling, homing, scaling, and network optimization. The combination of eMBB that promises peak data rates of 20 Mbps, uRLLC that guarantees sub millisecond response times and MMTC that can support 0.92 devices per sq. ft. brings with it some unique requirements. First, ONAP needs to support network services that include PNFs in addition to VNFs. Next ONAP needs to support edge cloud onboarding as network services will no longer be restricted to just large datacenters but will proliferate a large number of distributed edge locations. Finally, ONAP needs to collect real-time performance data for analytics and policy driven closed-loop automation. These requirements have led to several initiatives within ONAP to holistically address the 5G blueprint. CSPs, such as CMCC and Vodafone, see a strong demand for high-bandwidth, flat, high-speed OTN (Optical Transport Networks) across carrier networks. They also want to provide a high-speed, flexible and intelligent service for high-value customers, and an instant and flexible VPN service for SMB companies. The CCVPN (Cross Domain and Cross Layer VPN) blueprint is a combination of SOTN (Super high-speed Optical Transport Network) and ONAP, which takes advantage of the orchestration ability of ONAP, to realize a unified management and scheduling of resource and services. It achieves cross-domain orchestration and ONAP peering across service providers. ONAP supports the CCVPN use case with several key components: SO, VF-C, SDN-C, Policy, Holmes and DCAE. In this blueprint, SO is responsible for CCVPN end-to-end service orchestration working in collaboration with VF-C and SDN-C. SDN-C establishes network connectivity, then the VF-C component completes the Network Services and VNF lifecycle management. ONAP peering across CSPs uses east-west API which is being aligned with the MEF Interlude API. The key innovations in this use case are physical network discovery and modeling, cross-domain orchestration across multiple physical networks, cross operator end-to-end service provisioning and close-loop reroute for cross-domain service. Read the CCVPN Blueprint to learn more. This blueprint demonstrates how a Mobile Service Provider (SP) could deploy VoLTE services based on SDN/NFV. This blueprint incorporates commercial VNFs to create and manage the underlying vEPC and vIMS services by interworking with vendor-specific components, including VNFMs, EMSs, VIMs and SDN controllers, across Edge Data Centers and a Core Date Center. By using ONAP to manage the complete lifecycle of the VoLTE use case brings increased agility, CAPEX and OPEX reductions and increased infrastructure efficiency to CSPs. In addition, the usage of commercial software in this use case offers Communication Service Provider (CSP) a path to production. Read the VoLTE Blueprint and watch the technical overview video (在优酷上查看) to learn more. This blueprint addresses a residential use case, where the services offered to a subscriber are currently restricted to what is designed into the broadband residential gateway. In this blueprint, the customer has a slimmed down physical CPE (pCPE), that only consists of bridging functionality, attached to a traditional broadband network such as DSL or DOCSIS (Figure 5). A tunnel is established to a data center hosting various VNFs providing a much larger set of services to the subscriber at a significantly lower cost to the operator. ONAP supports complex orchestration and management of both virtual and underlay connectivity with two key components–SDN-C, which manages connectivity service , and APP-C, which manages virtualization services. In this case, ONAP provides a common service orchestration layer for the end-to-end service. This blueprint shows advanced functionality such as scaling, change management , HPA and cloud agnostic intent. Read the Residential vCPE Blueprint and watch the technical overview video (在优酷上查看) to learn more.